Manufacturer of a wide range of products which include knee joint pain device. We are the manufacturer of Knee Laser Pain Relief is an advance therapy device which is provided with Laser Radiation Technology Combined with compression and heating technique. It basically improves micro circulation and metabolism in the radiating area. In addition to this, it improves tensile strength of the tissues, eliminates inflammation, reduces oedema and stiffness in the tissues thereby providing relief from the pain. Packaging Details: Additional Information: Item Code KS-21 About us DR CURE AND CARE began operations in its current form in 2015 at Delhi. We are one of the reputed manufacturer and supplier of a wide range of Physiotherapy & Rehabilitation Equipment. 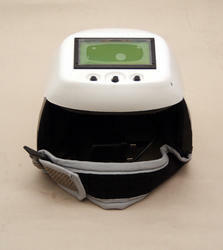 We offer products like Laser Therapy, Knee Laser Pain Relief, Hair Grow Device Helmet, Laser Comb and many more. Supported by dedicated engineers & marketing professionals we have been able to offer hi-tech products to our widespread clients. Rendered in accordance with global quality parameters, our services are appreciated for their timeliness, reliability and cost-effectiveness.. We also offer these products as per the various specifications given by the clients with the help and support of our trustworthy vendors. Apart from this, these products are extensively used in various domestic sectors too. Looking for Knee And Shoulder Pain Device ?